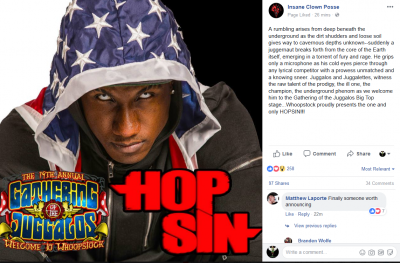 News > Psychopathic News > Hopsin Announced for Gathering of the Juggalos 2018! 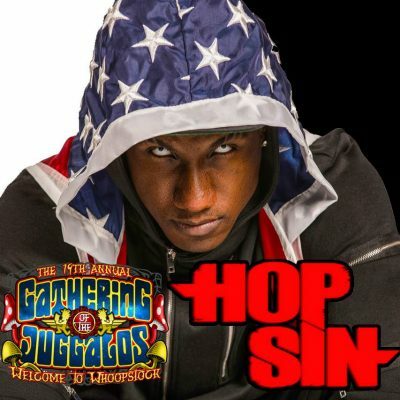 Hopsin Announced for Gathering of the Juggalos 2018! Everyday a fresh new exciting announcement arises in regards to this years Gathering of the Juggalos in Thornville, Ohio and it just keeps getting bigger and better! California’s underground hip-hop pioneer, the one and only Hopsin, has just been announced to perform on the Big Top Stage at this years GOTJ! We’re not sure exactly what day at the Gathering Hopsin will be having the Juggalos going beyond crazy thanks to his live hyped emcee originality because the GOTJ timeline hasn’t been dropped yet, but it’s been officially confirmed by Insane Clown Posse’s and Psychopathic Records official social media pages that the “Ill Mind” genius will indeed be at Whoopstock! Psychopathic roster, Killjoy Club, Esham, Kingspade, Hopsin, RA the Rugged, Immortal Technique, Yelawolf, Seed of 6ix, and GWAR. Yes! Psy is just dropping nuclear bombs, I knew they’d get Hopsin this year with all the other dope MCs they’ve been booking. Lets get some King810 next?? Yeah PSY is KILLEN it with the performers this year!!!! !